Try scorer Danie Poolman is one of four players who could be playing in the centre. Connacht head coach Pat Lam has signed a new three-years deal ashis squad heads to France for the final European Challenge Cup pool fixture with qualification hopes still alive. Connacht need a bonus-point win from their visit to La Rochlle to qualify for the quarter-finals as one of three best runners-up, but even securing that result could depend on results elswhere. Having suffered the setback last weekend at home to pool two favourites Exeter by 33-24 at the Galway Sportsground, Pat Lam’s squad will take on La Rochelle on Saturday evening knowing they must produce an improved performance to give them every chance. “There is no doubt we want to win, and we are going all out to get a win,” Lam says. Unfortunately for the squad, injuries have robbed them of Robbie Henshaw, sidelined with an ankle injury, and also Craig Ronaldson who suffered a quad strain in the pre-match warm-up last Sunday. And with Bundi Aki also unavailable, Dave McSharry, undergoing return to play protocols for concussion, has been ruled out also. Lam does have options, which will mean rejigging his team. Mils Muliaina, Darragh Leader, Conor Finn, who played against Bayonne, and Danie Poolman, have all played in the midfield. What is clear is that Lam will want to take his best available squad to France to give them every chance of a victory. Whether or not the Challenge Cup has been devalued, or that Connacht could face the top seeds away from home, a quarter-final place in the cup has now become a goal. It will certainly require an improved performance from the second half they displayed against Exeter last weekend. Dynamic out wide, Connacht paid the price for some poor kicking and a lack of dynamism at the breakdown - Lam counted 20 turnovers in all, which he described as unacceptable. The scrum, one of Connacht’s strengths this season, was also under pressure, but assistant coach Dan McFarland will have looked at that closely this week. Despite a “woeful” opening 10 minutes in the second half, Lam believes the problems are not permanent. In the end, however, Connacht could not quell the Chiefs' power play to secure a home semi-final. Instead they must take the hard road and go to France needing a bonus-point win to give them any chance of an away runners-up spot. Although Connacht's attacking play was superior out wide, scoring four tries to three, they coughed up too much possession, were on the wrong side of a 13-4 penalty count, and crucially were dominated in the scrum. "To score four tries to three and not win the game is frustrating,” said Lam. 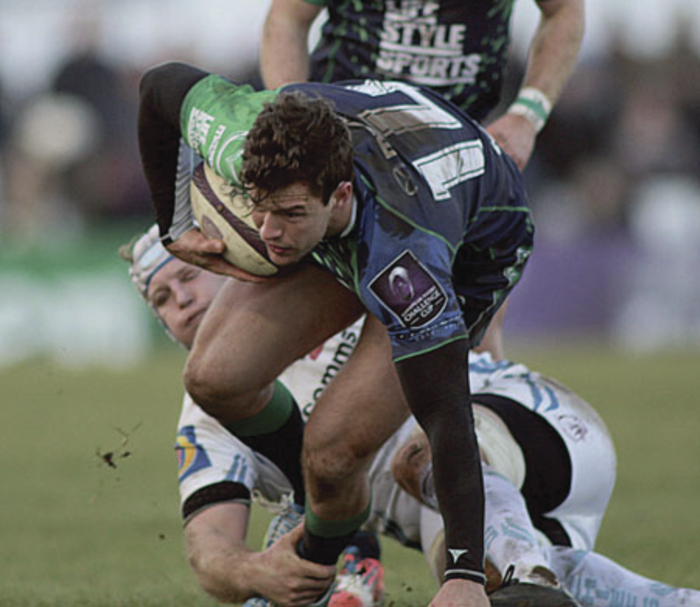 Connacht had carved out a 17 - 10 lead, courtesy of three superb tries from Danie Poolman, Matt Healy, and Wille Faloon. Connacht, attacking from the start, were rewarded when Willie Faloon supplied Healy who skated in after six minutes, while outhalf Jack Carty, a last minute replacement for Craig Ronaldson, was unable to add the conversion. Exeter, helped by some poor kicking, established field position, and three line-outs, three scrums, three penalties, and six minutes later, they were rewarded with a penalty try with Henry Slade slotting the conversion in the 20th minute . Connacht's response was immediate. Winning their first penalty, they took advantage to kick for touch, and with all but Mils Muliaina and Poolman joining in the drive, Connacht forced their way over with Willie Faloon claiming the touchdown. Although Carty missed the conversion, and Slade posted one of two penalty attempts to draw level, Connacht finished the half with a flourish. From Healy's counterattack, Connacht capitalised with Poolman bagging try number three. Carty’s conversion edged the home side 17-10 in front by the break. However Exeter had cut that lead to four within minutes of the restart. Henry Slade struck a penalty after Connacht were pinged at the breakdown, and when Poolman's attempted pass was intercepted, Australian international Dan Mumm raced in unopposed. Slade had no difficulty adding the extras and a 57th minute penalty as the Chiefs took control. Flanker Don Armand, who should have extended the lead from a second intercept, claimed Exeter's third try and Slade's conversion pushed the lead to 17 - 30. As Connacht continued to concede penalties and territory, Slade posted a 70th minute penalty to dash Connacht's automatic qualification hopes. The only consolation was a fourth try from Healy, set up by the influential Robbie Henshaw which Carty converted. Darragh Leader had the chance to grab a second bonus point, but his effort from the 10m line sailed wide. Connacht Rugby: M Muliaina; D Poolman, R Henshaw, D McSharry, M Healy; J Carty, K Marmion; D Buckley, T McCartney, R Ah You, Q Roux, A Muldowney, J Muldoon (c ), W Faloon, G Naoupu. Replacements: D Leader for McSharry (39 ), F Bealham for Ah You (ht ), A Browne for Muldowney and E McKeon for Muldoon (64m ), JP Cooney for Buckley and D Heffernan for McCartney (68 ), M Nikora for Muliaina and C Blade for Marmion (70m ).